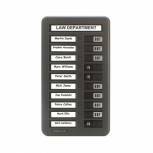 Indesign 20 Names In/Out Board Grey WPIT20I Pack of 1 Indesign Wall Mounted In/Out Board. Keeps track of staff movements for security and safety purposes. Simple sliding mechanism shows in or out. Inserts supplied on a strip for typing or labelling. Complete with fixing kit. 20 names. 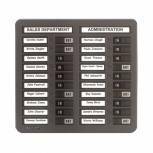 Indesign 10 Names In/Out Board Grey WPIT10I Pack of 1 In/out board for small teams/departments. Includes department title and 10 names. Single column design. Simple in/out sliders for attendance. Quick reference in emergencies or at assembly points. Size: 597 x 220mm. Non returnable. 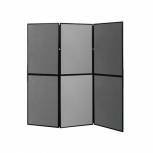 Bi-Office Fire Retardant Internal Display Case 874x603mm ST350101150 Pack of 1 Fire retardant construction and fabric surface independently tested according to EN13501. 874 x 603mm. Fits 8xA4 sheets. 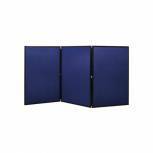 Bi-Office Fire Retardant Internal Display Case 1310x903mm ST390101150 Pack of 1 Fire retardant construction and fabric surface independently tested according to EN13501. 1310x903mm. 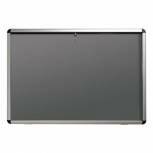 18xA4 sheet capacity. 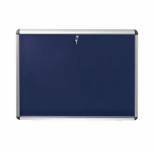 Bi-Office Lockable Internal Display Case 1780x1180mm Blue VT770107150 Pack of 1 Lockable interior display case with strong acrylic doors and aluminium frame. Felt covered notice board is fire. Internal depth of 18mm. Supplied with two keys. 1180 x 1780mm. Blue. 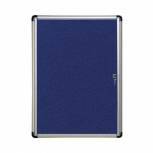 Bi-Office Lockable Internal Display Case 931x670mm Blue VT630107150 Pack of 1 Bi-Office Felt Display Case with an Oval Aluminium Frame. 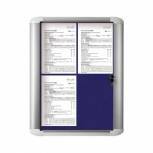 Display notice board for interior use featuring fire retardant felt. Anodised aluminium frame and strong lockable acrylic doors. Fits 9xA4 sheets. Size 670x931mm. Notec Board - Blue. 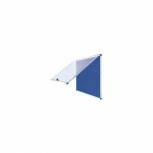 Bi-Office External Display Case 450x614mm Blue VT610107760 Pack of 1 Display case suitable for external use. Keeps display material secure and clean. Lockable - supplied with 2 keys. Anodised aluminium frame. Fire retardant Blue felt background. Bi-Office Lockable Internal Display Case 1110x930mm Blue VT640107150 Pack of 1 Lockable interior display case with strong acrylic door and aluminium frame. Felt covered notice board is fire retardant. Internal depth of 18mm. Fits 15xA4 sheets. Supplied with two keys. 930 x 1110mm. Blue. 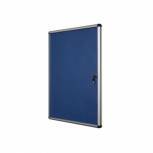 Bi-Office Lockable Internal Display Case 890x625mm Blue VT690107160 Pack of 1 Glazed lockable display board ideal for securely and safely displaying materials. Keeps display material safe and clean. Internal depth 55mm. Aluminium frame and track. Toughened glass sliding doors. Fire retardant Blue felt. 890 x 625mm 8xA4 sheets. 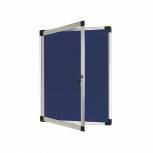 Bi-Office External Display Case 670x934mm Blue VT630107760 Pack of 1 Display case suitable for external use. Keeps display material secure and clean. Lockable - supplied with 2 keys. Anodised aluminium frame. Fire retardant Blue felt background. 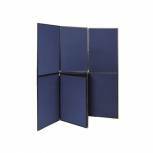 Bi-Office A-Frame Info Board A1 DKT40303032 Pack of 1 Bi-Office A-Frame Infoboard. 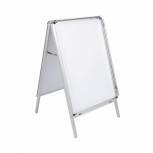 Free standing A1 double sided board with an anti-glare PVC cover keeping sheets, posters and inserts free from dust and dirt. 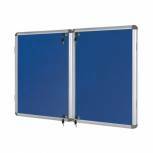 Simple to use just lift up the four edges, remove the protection sheet and insert new posters etc. 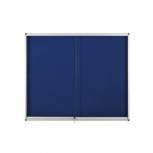 Nobo Lockable Visual Insert Board 965x665mm Blue 1902048 Pack of 1 Lockable Acrylic Front Notice Board with modern curved profile aluminium trim and Straight through fixings. Ideal for any environment where notices are left on display for some time. Size - A1. 965x665mm. 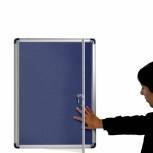 Nobo Lockable Visual Insert Board 965x665mm Grey 31333500 Pack of 1 Lockable acrylic front notice board with modern curved profile aluminium trim and Straight through fixings. Ideal for any environment where notices are left on display for some time. Size - 900x600mm. Grey. 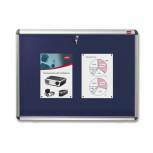 Nobo Lockable Visual Insert Board 1265x965mm Grey 31333501 Pack of 1 Lockable Acrylic Front Notice Board with modern curved profile aluminium trim and Straight through fixings. Ideal for any environment where notices are left on display for some time. Size - 1265x965mm. Grey.